Pinky's up, ladies! I hope that you will join me on Sunday, October 21 for PositiviTEA, for a brunch full of inspiration and celebration, benefiting over 200 women of Legacy's Grace Project. This year's tea (there will also be a mimosa bar!) 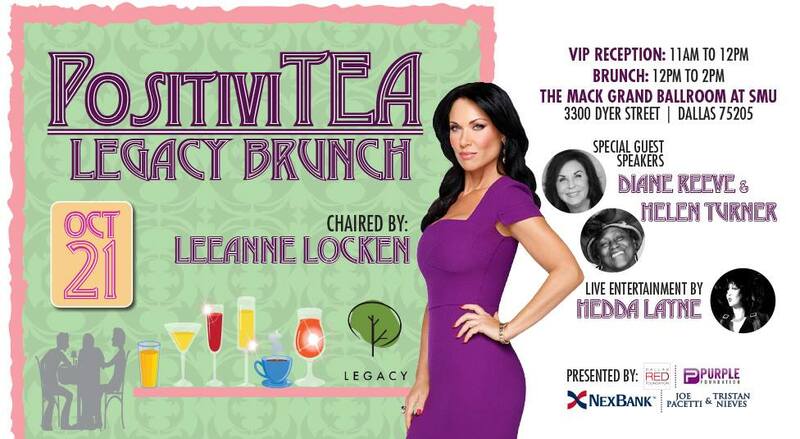 is Chaired by Real Housewives of Dallas star, LeeAnne Locken and will be held at the beautiful Martha Proctor Mack Ballroom at SMU. In addition to brunch, guests will enjoy wonderful entertainment, an exquisite silent auction and hear from inspiring speakers. All proceeds benefit Legacy's Grace Project, the largest conference in the World designed specifically for women living with HIV/AIDS. Tickets & Sponsorships Available at https://cbo.io/legacy/PositiviTea.